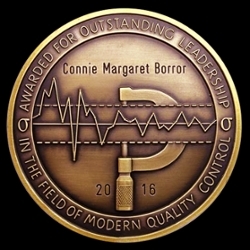 Southern Illinois University Edwardsville alumnus Connie M. Borror, PhD, has been awarded the 2016 Shewhart Medal, the highest award granted by the American Society for Quality (ASQ). She is the first woman to have received the award in its 67-year history. The coveted industry award recognizes “outstanding leadership in the field of modern quality control.” The ASQ presented Borror with the medal at a ceremony in Arizona this spring. Since the announcement of this historic accomplishment, Borror passed away on Sunday, April 10. Borror was a professor in the Division of Mathematical and Natural Sciences at Arizona State University (ASU) West, and Fellow of the ASQ and the American Statistical Association. A native of Granite City, Borror earned a bachelor’s and master’s in mathematics from SIUE in 1988 and 1992, respectively. She went on to achieve a doctorate in industrial engineering from Arizona State University. Borror shared her passion for statistical data analysis and its diverse applications, and her reaction to the receipt of this award in an article posted by ASU on January 26. A complete obituary can be found in the Belleville News-Democrat.